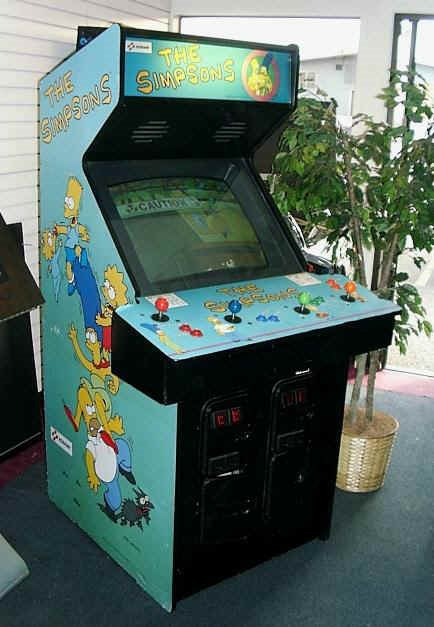 The Simpsons Arcade Game is an arcade game created in 1990 and released on March 4, 1991. 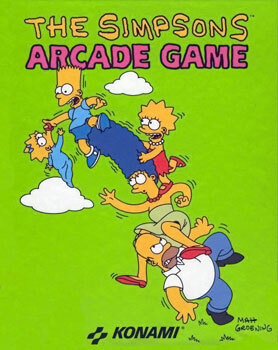 It holds the distinction of being the first Simpsons game to be released. The game is based on the Teenage Mutant Ninja Turtles arcade game which was released in 1989 and made by the same company, Konami. The game has been re-released on numerous different platforms including Commodore 64, PC and PlayStation Network. The Simpsons are walking in the street when Smithers, who stole a diamond from a Jewel Shop for Mr. Burns, accidentally bumps into Homer. This sends the diamond flying and landing in Maggie's mouth. Smithers kidnaps Maggie and runs off with the diamond in her mouth, prompting the Simpsons to pursue him and attempt to rescue Maggie. On the way, they encounter goons hired by Mr. Burns to stop the family from getting Maggie back and are forced to fight them. After defeating several goons (including the wrestler Professor Werner von Brawn), they chase Smithers into Krustyland, where they are attacked by Clowns and rabbits (from Matt Groening's original cartoon Life in Hell). They corner Smithers on a Krusty balloon but the balloon pops, sending the family and Smithers falling down to Springfield Cemetery. Zombies waken up by Mr. Burns rise from their graves and attack the Simpsons family, but the family fight them off. The Simpsons family then follow Smithers into Moes Tavern, where they encounter several mobsters and a Drunk which they are forced to fight. The Simpsons later follow Smithers to the Springfield Butte. Smithers is fleeing from a bear and carries Maggie towards a river, and the Simpsons follow his trail, battling woodsmen and apes on he way. The bear that was chasing Smithers went to kill the Simpsons, but the family defeat the bear. Smithers escapes by helicopter and the Simpsons family are sent down a large waterfall and are knocked out. In their coma, the Simpsons envision themselves in the clouds and in their minds they battle a gigantic bowling ball. After waking up, they see the helicopter landing on top of the Channel 6 studio. They get in the studio and see Scott Christian doing a news report on Maggie's kidnapping. They have a brief battle with a Japanese Kabuki Warrior before hopping on a helicopter to the Springfield Power Plant, where Smithers has taken Maggie. At the Power Plant, the Simpsons family confront Smithers, who battles them with bombs.When Smithers is defeated, Mr. Burns breaks through the wall inside a large machine which attacks with Bombs, Lasers, Missiles and Pincers, and starts a climatic battle agains the Simpsons. After a long fight, Burns is defeated, and the Simpsons rescue Maggie, who places her pacifier into Mr. Burns' mouth. They celebrate along with Grampa, Patty and Selma. In the end, Homer throws the diamond away and Maggie puts her pacifier back into her mouth. 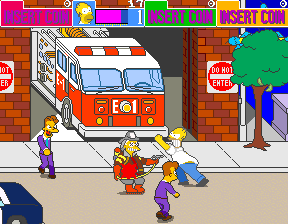 Homer faces off against a number of goons including one dressed as a fireman. The player chooses from one of the four Simpsons family members: Homer, who punches and kicks; Marge, who swings her vacuum cleaner; Bart, who wields his skateboard; and Lisa, who uses a jumprope like a whip. The game's levels are based on various locations from Springfield, including Downtown, Krusty Land, the Graveyard, Moe's Tavern, Springfield Butte, a Dreamland, the Channel 6 studio and the Springfield Nucler Power Plant. Each level ends with a boss whose speed and strength would increase after taking a set amount of damage. Although the game is one of many beat 'em ups produced after Final Fight, it contained many innovations, including the option for two players to team up and attack enemies, with the exact attack differing slightly depending on which two characters were being used. Food could be used for healing, and various weapons and items could be obtained for use for a short time or for a one-time projectile attack. These items were often brought into the game by other Simpsons characters, and the Simpsons' own pets could be used as thrown weapons at various points in the game. The Japanese version of the game included small scale nuclear bombs that, when thrown, clear all on-screen enemies, as well as a life bar that can be doubled by eating food when your character's health was full. The main characters retained their voice actors from the show. The game features two minigames in which players competed against each other to be the first to finish a task (inflating a balloon shaped like their character in the first game, waking up their character in the second). The minigame was based on repeated button-pushing, with the player who pushed the buttons fastest winning. If fewer than four players were present, the player or players competed against 1-3 computer-controlled characters in these minigames. During the game, if the player does not press any buttons the selected character will break the forth wall, aside from Homer who only yawns. Marge says "How's my hair? ", Bart says "Who the hell are you? ", while Lisa makes a face at the player saying "Ha ha, made you look!". The game featured many strange enemies, ranging from the infamous men in the purple suits, to battles with Bongo-like rabbits. The game included battling fat, old men; miniboss-like firemen; and even giant donuts. One of the visual gags in the game include Marge showing rabbit ears similar to the Life in Hell rabbits, like her skeletal silhouette when electrocuted. On February 3, 2012 the game was re-released on Xbox Live Arcade and on February 8 on PlayStation Network. Four weeks after the release, the game was free for players of PlayStation Plus. A gameplay inspired remake by EA games was made for iPhone. The new features in the remake is 4-player online cooperative play, online higscore, quarters mode that recreates the original coin-op classic, survival mode that tests players' skills with only one life and free play mode that that provides players with unlimited continues. Also included is the Japanese version of The Simpsons Arcade Game, which features new weapons, higher scoring and a slightly different ending. The game also includes pictures on flyers and posters made for the game in 1991. Modified on April 19, 2017, at 14:16.